You can use the FieldDAQ device as expansion I/O from certain NI Linux Real-Time controllers. Discover and configure the NI Linux Real-Time controller in NI MAX, then discover and configure the FieldDAQ device. When using an NI Real-Time controller as the host, you can only use select controllers with the NI Linux Real-Time operating system that support NI-DAQmx. Supported NI Linux Real-Time controllers include the IC-317x, cRIO-9035/9039 Sync, cRIO-904x, and cDAQ-9132/9133/9134/9135/9136/9137 for LabVIEW Real-Time. 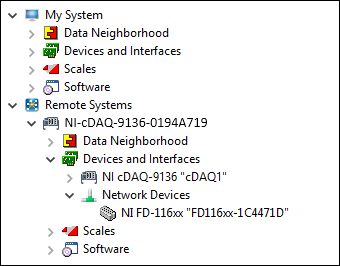 To network the FieldDAQ device to a Real-Time controller, you need the following items. LabVIEW Real-Time 2017 or later required to use the FieldDAQ synchronization features. You can either use a shielded straight-through Ethernet cable or an Ethernet crossover cable to connect the FieldDAQ device directly to your computer. Install the LabVIEW, LabVIEW Real-Time Module, and controller driver software on the host machine as instructed in the getting started or quick start document for the Real-Time controller. Install NI-DAQmx on the host machine if the driver was not installed in step 1. Download NI-DAQmx from ni.com/downloads/drivers. Complete the instructions. Register your NI hardware online at ni.com/register when prompted. Download NI-DAQmx to the target using MAX. Refer to the MAX Remote Systems Help by selecting Help»Help Topics»Remote Systems in MAX. Set up your Real-Time controller hardware and install software to it as instructed in the getting started or quick start document for the Real-Time controller. For CompactRIO and IC controllers, perform a custom installation of the NI-DAQmx feature to the controller. In MAX, expand Remote Systems»your Real-Time Controller, and use the Add/Remove Software option. Select the custom installation option and the NI-DAQmx feature, then follow the prompts to complete the installation. Carefully align and connect one end of the Ethernet cable to Ethernet port 0 on the FieldDAQ device, and the other end to a switch or network connection on the same subnet as your Real-Time controller, or directly to an open network port on your Real-Time controller. Power the device by carefully aligning and connecting the power IN port on FieldDAQ to an external 9 V DC to 30 V DC power source with the 5-pin L-coded M12 power cable. The Power LED lights. To add the FieldDAQ to the software configuration on the Real-Time target, open NI MAX on the host computer. In the MAX configuration tree, expand Remote Systems»your Real-Time Controller»Devices and Interfaces»Network Devices. Click Add Network Device, and then Find Network NI-DAQmx Devices. Check the box that corresponds to your device in the Hostname column. If you know the device IP address, such as 192.168.0.2, enter it into the Add Device Manually field of the Find Network NI-DAQmx Devices window, and click the + button. Enter the hostname of the device. The default hostname is FD116xx-<serial number>. If your FieldDAQ device does not appear in Available Devices, click Refresh List. If the device still does not appear, contact your system administrator to confirm that the network is working and that a firewall is not interfering with discovery. Click Add Selected Devices. The FieldDAQ device is added under the Real-Time controller in the MAX configuration tree. If the FieldDAQ device is not reserved automatically, select the device and click the Reserve Network Device button. Self-test your device in MAX by expanding Devices and Interfaces»Network Devices, right-clicking your FieldDAQ device, and selecting Self-Test. Self-test performs a brief test to determine successful device installation. When the self-test finishes, a message indicates successful verification or if an error occurred. If an error occurs, refer to ni.com/support/daqmx. Run a Test Panel in MAX by expanding Devices and Interfaces»Network Devices»your FieldDAQ device, right-clicking the bank of connectors in your FieldDAQ device, and selecting Test Panels. If the test panel displays an error message, refer to ni.com/support. Click Close to exit the test panel. When in use, the FieldDAQ device may become warm to the touch. This is normal. M12 connectors must be mated to cables or have caps installed on them to meet IP requirements. Cover the unused connectors with the included plastic caps whenever water, dust, or dirt are present. Avoid long periods of exposure to sunlight. 1 The cDAQ-9138/9139 for LabVIEW Real-Time controllers will not work in this configuration.